Trees Not Looking Too Healthy? 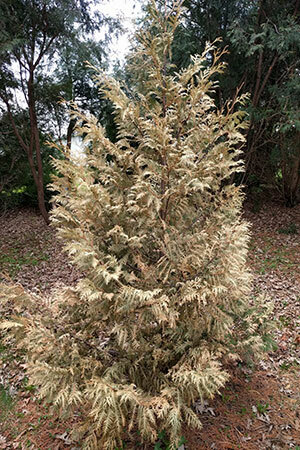 Arborvitae killed by winter drying. One of the big headlines for gardeners and home owners this year is all about trees. Trees appearing to turn brown, trees turning yellow or not leafing out at all; conifers with multiple dead limbs particularly among the lower branches, even dying outright. So what’s happening? In this summer’s “Forest Insect and Disease Newsletter,” the team said since May, it has fielded reports from Anoka, Fillmore, Freeborn, Goodhue, Hennepin, Houston, Rice and Winona counties about dead evergreens—in particular black hills spruce, white cedar (arborvitae) and white pine. Recommendation: Schwingle suggests immediately removing any conifer with more than half of its branches killed by winter drying to avoid an attack by bark beetles. From Brainerd and Sauk Rapids to Hinckley and even Chanhassen, reports came into the DNR about bur and white oaks that barely leafed out this spring. The team says it hasn’t “solved this puzzle” yet as to why this severe dieback happened, but suspect it may have something to do with cynipid wasps. Masting on a west metro maple tree. Maples: Are the leaves brown or is it seeds? 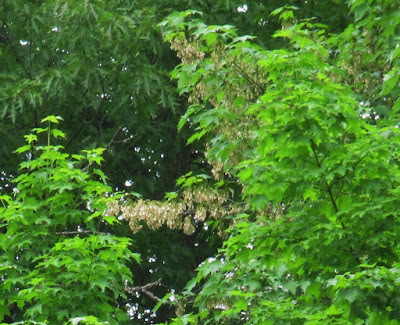 Extension Horticulturist Mary Meyer wrote this spring about the large number of seeds being seen on maples and Siberian elms (”Brown foliage on your maple trees & American elm? Look closely…it may be seeds!”). Recommendation: Sometimes the outer branches on maples that produce these bumper crops of seeds can die, but trees recover over time. 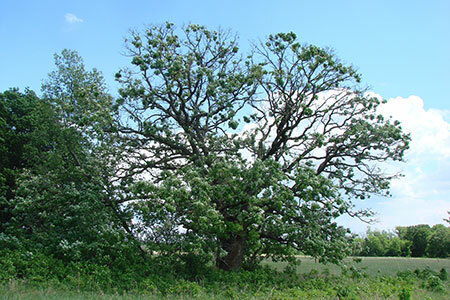 Meyer also recommends that you examine your trees for any signs of stress (or distress) which can also cause excessive seeds to pinpoint other possible causes. Black hills spruce with stigmina needle cast. Have the needles on the lower branches of your spruce tree died? The DNR says it’s a common tree health concern. 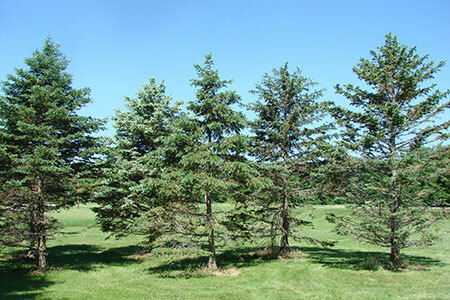 Spruce trees planted in a row are susceptible to a needle cast disease caused by a fungus. Stigmina needle cast disease appears when there’s lots of rain, and moist conditions around your tree(s). They are particularly susceptible if planted in a low-lying area. If your tree is growing by itself in the sun and away from other trees with good air circulation, it will rarely be affected. Plant spruce in full sunlight by themselves. Alternate spruce with different trees. Remove every other spruce if you do have a row of them and their branches are in contact with each other. Don’t spray water on needles or up into the tree. And prune lower canopy branches. 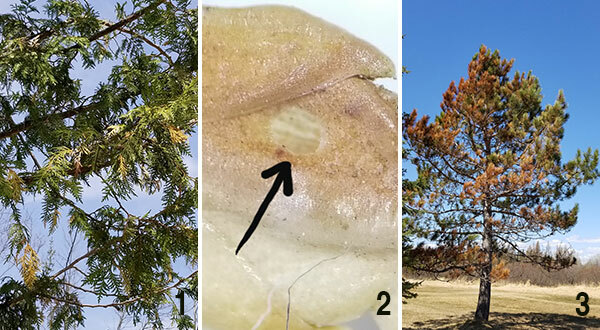 The team determined a regional outbreak of a pest called arborvitae leafminer has caused some of the yellowing, or yellow tips. These small silvery moths lay their eggs on arborvitaes in June and July. The larvae tunnel into the foliage, feed into the fall, then overwinter in the tree. Those yellow leaves may also be a sign of winter injury, which often appears on the south and southwest sides of the tree where the sun shines. 1. Northern white cedar near Hill City showing yellowing shoots from arborvitae leafminer infestation. 2. Black arrow pointing to an exit hole created by the arborvitae leafminer (magnified 40x).3. Red pine showing symptoms of winter burn on the south side of the tree. Recommendation: Water, fertilize and prune your trees. This is the best way to prevent damage. Otherwise, unless a tree is severely infested, there’s no need to control cedar leafminers. You can try to destroy the caterpillars in the spring by picking them off. Check your trees in March and April, and prune the infested twigs from the tree.